What are the varieties of sunflowers? Like many people who savor gardening as a hobby, we fancy the bright colors and upbeat feeling a sunflower brings! So, how many varieties of sunflowers are there? First, SUNFLOWERS belong to the genus Helianthus, which contains over 70 species. Most varieties are annuals; but, Helianthus incorporates 38 species that are perennial (grow back every year on their own). With so many cultivars out there one can get overwhelmed quickly! We’ve identified several Sunflower favorites to make it easier. 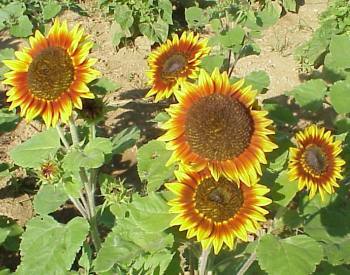 The variety called “Holiday Sunflower” has uneven heights and multiple blooms. Sunflowers track the sun throughout the day, but when they are fully grown the mature flower-heads face towards the east and no longer move. To grow the best sunflowers they will need full sun! The variety called Ring of Fire is another dwarf sunflower species that is very uniform and under 3 feet in height. 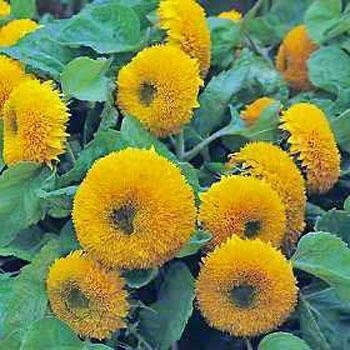 Dwarf sunflowers are a perfect choice if you want to grow sunflowers in a pot or window container. After choosing the size of the container, add a layer of small rocks to help the soil drain. To grow sunflowers you will need fertile moist soil with heavy mulch. 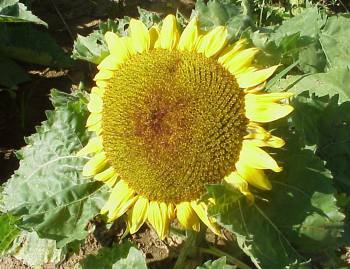 The variety called Big Smile Sunflower is under 2 feet in height, has multiple blooms and is a Dwarf Sunflower Plant. The sunflower stem is rough and hairy with a circular head of flowers. The head has hundreds of individual flowers which mature into seeds. The sunflower species called Autumn Beauty branches out with a variety of yellow, red and orange colors. In the 16th century, sunflower seeds from the Americas were brought to Europe along with sunflower oil and they became a popular cooking ingredient. 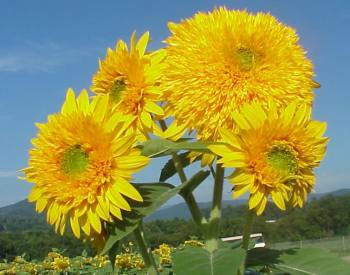 Tohokujhae Sunflowers are bright yellow with multiple blooms. This variety has big double flowers 6-7 inches across. The height of Tohokujhae sunflowers is 3-6 feet. 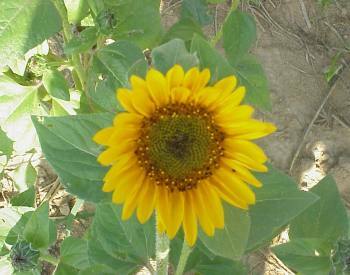 The leaves of the sunflower can be used as cattle feed and the fiber in the stems can be used in the production of paper. Some say Sonja Sunflowers are a weaker variety. The height is uneven and ranges from 3-5 feet. This sunflower has a dark center with big yellow petals. 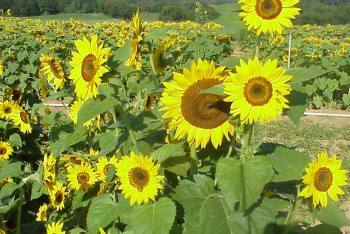 TIDBITS: The sunflower is the state flower of Kansas, USA. 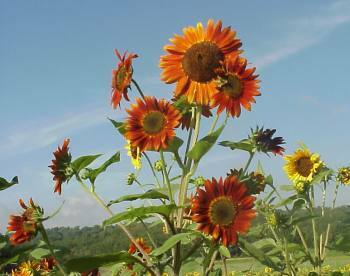 American Indians had various uses for sunflowers, such as in bread, medical ointments, dyes and body paints. Author tjsgardenPosted on June 27, 2017 June 27, 2017 Categories Arizona Wildflowers, Flowers, Free Pictures, Sunflowers, Unique Garden ItemsTags Autumn Beauty Sunflower, Big Smile Sunflower, Desert Flower, Desert Garden Plant, desert sunflowers, different sunflowers, growing dwarf sunflowers, Heat Resistant Plants, Holiday Sunflower, mirasol, pics of sun flowers, Ring of Fire Sunflower, small dwarf sunflower, Sonja Sunflower, sunflower growing, sunflower pictures, sunflower species, sunflower varieties, sunflowers in pots, teddy bear sunflower, Tohokujhae, varieties of sunflowers, wild sunflowers13 Comments on What are the varieties of sunflowers?